Hopefully you are a Patriots or Rams fan going into this weekend, so you can see your team play for a chance to hoist the Lombardi Trophy Sunday night. Well even if you aren’t a fan of those teams, you’re probably going to a Super Bowl party, or maybe you are even hosting one this weekend. Everyone enjoys a different aspect of a Super Bowl party. Some people are die-hard football fans like me who want to watch every play. Some people just watch the Super Bowl for the halftime show and the always controversial Super Bowl commercials. Some people just want to see the Patriots Dynasty end (not happening!). Well whatever kind of viewer you are, everyone looks forward to the variety of amazing foods at a Super Bowl party. The problem with these foods are, most of them are very unhealthy. I don’t need to go down the line of popular Super Bowl foods, but they aren’t usually made with health in mind. 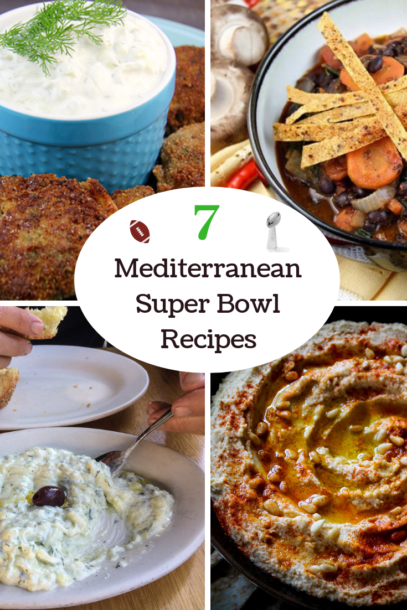 This is why I made this list of Mediterranean Super Bowl recipes for you. The great thing about Mediterranean food is that it still has a lot of fat (healthy fat) and flavor without being bad for you. If something is fried, it’s fried in extra virgin olive oil. The dips from the Mediterranean use extra virgin olive oil, yogurt, vegetables, and beans/legumes as a base instead of things like cream cheese, ranch, mayonnaise, blue cheese, buffalo sauce, barbecue sauce, ketchup, or any other fattening, non-nutritious base. So try some of these popular recipes for your Super Bowl party and you won’t feel guilty about going back to the appetizer table time and time again. Tzatziki is a classic Greek dip that goes with pretty much everything. When my ranch dressing loving American friends visited me in Greece one summer, tzatziki turned into their new ranch. My absolute favorite is dipping french fries, fried in extra virgin olive oil, in this tzatziki. If you’re looking for a great healthy dip for your Super Bowl party, this is it! Speaking of good things to dip in tzatziki, these fritters are more than that. If you want to wow your guests with a Super Bowl food they’ve never had, these fritters are dynamite. I know you probably don’t want to be frying right before the game, so make these ahead and keep them warm in the oven. They will stay beautifully crispy and warm for when the game starts. This recipe is perfect for your vegetarian/vegan guests. A super simple one-pot recipe that is loaded with vegetables, spices, and is ready in just 45 minutes. This is a recipe from Bill Bradley’s first cookbook, Things to do with Black Bean Stew, which you can purchase right in our shop. Super Bowl parties aren’t complete without foods you can eat with your hands. Souvlaki is a food eaten on special occasions, and the Super Bowl is a very special occasion in this country. A lot of finger foods aren’t very healthy because they’re fried or loaded with sugar/bad fats. Souvlaki is marinated in extra virgin olive oil, herbs and spices, lemon juice, garlic, and grilled to perfection for a healthy finger food loaded with flavor. I highly recommend pairing this recipe with the first recipe in this post, Loaded Tzatziki Yogurt Sauce with Fresh Dill, Garlic, and Cucumber. This is a kicked up version of our original tzatziki recipe. Tzatziki is the perfect cooling dip to contrast the smokey grilled meat. Any party or get-together I attend, if there’s hummus served as an appetizer, I’m all over it. First of all, it’s really healthy for you. My favorite is when there’s a hefty drizzle of raw extra virgin olive oil on top. Jazzing up a bowl of hummus for a nice presentation is really easy and makes all the difference. You can sprinkle on paprika and pine nuts plus a drizzle of olive oil like I did above. Another way is to add freshly chopped herbs on top. 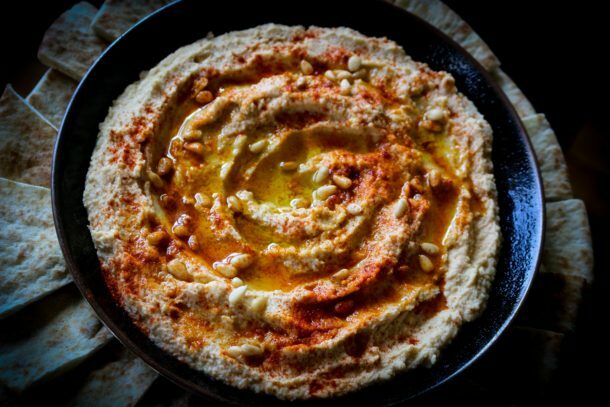 Fresh parsley works best for this because it won’t overpower the hummus but it will add a beautiful green color. I talked above about how my absolute favorite thing to dip in tzatziki is french fries fried in extra virgin olive oil. This is the ultimate healthy french fry recipe. I recommend frying these before the game and keeping them warm in the oven so you’re not stuck cooking while the game is on. If you’re having a lot of people to your Super Bowl party then you’re going to want to double or triple the recipe, depending on how many people. It takes 10-15 minutes for each batch of fries to fry completely so you’ll need to plan accordingly. If you take the time to make these though, they will be the star of the show, besides Tom Brady of course. These are loaded with flavor and cooked in a savory simple tomato sauce that keeps them moist and delicious. For your Super Bowl party, I recommend serving these with toothpicks in them so people can easily grab them. Serve these with plain Greek yogurt for the perfect dip. For anyone who is rushing to come up with something to make for your Super Bowl party, this Instant Pot recipe is what you need! A delicious stew with super tender pork, but also lots of vegetables, which takes no time in the Instant Pot, this recipe is going to save you! This is a favorite Mediterranean recipe for guys who are trying Mediterranean food for the first time. George studied International Business in Greece in 2015 for three semesters. His family is from the island of Crete, and he lived with them for a whole summer. During that time, he started working for Mediterranean Living and contributing his firsthand experiences of the traditional Cretan diet. He learned fluent Greek along the way, being fully immersed in a traditional Cretan village. He is since graduated with a business degree from Worcester State University. George loves language and traveling, so he completed a TEFL certificate program at the Boston Language Institute in order to teach English abroad and travel the world. He currently works full-time blogging, recipe formulating, and social media marketing for Mediterranean Living. His passions include language, gardening, hiking, skateboarding, and watching sports. He dreams of living in Crete one day, after he travels the world learning as many languages and cultures as possible.